A series of pre-construction condominium towers proposed by QuadReal Property Group . 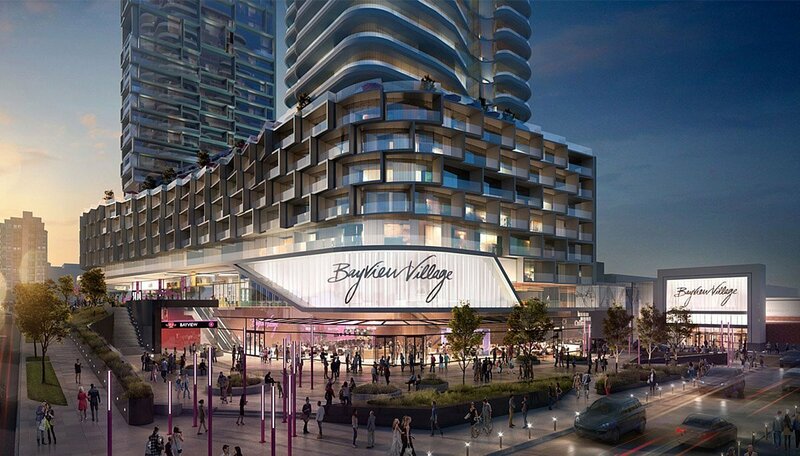 An ambitious project that also calls for a redevelopment of the upscale shopping centre on site, Bayview Village cndominium project is located at North York’s Bayview Village neighbourhood. 1,000 residential units will be added to the community as part of this project, along with retail upgrades and almost 10,000 square-feet of parkland. 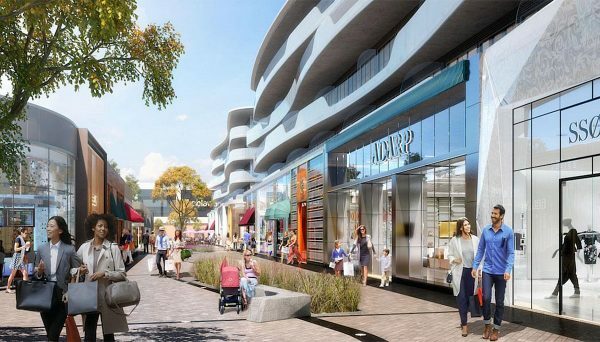 The site for this proposal is located at 2901 Bayview Avenue, the current location of the Bayview Village Shopping Centre, which houses almost 40,000 square-feet of retail, office, banking and restaurant space and serves a high-end market. This proposal deals with the north portion of the site and the southwestern portion. The north portion will eventually house three mixed-use buildings ranging from six to 19 storeys, along with the upgraded north face of the shopping centre. As part of this upgrade, new commercial space will be added and a sleek, contemporary retail promenade will be included. In total, this portion will add 372 residential units, spanning a mix of one, two and three-bedroom layouts within the towers. The southwest portion will include two mixed-use towers, one standing 28 storeys and one standing 33. The towers will be anchored by an eight-storey podium containing amenities and commercial space. The buildings in this proposal are being designed by renowned architectural firms Hariri Pontarini and DIALOG. Other improvements for the site include landscaping, water features, enhanced lighting and seating areas, as well as two separate park spaces. This is easily one of North York’s most anticipated mixed-use projects, adding significant high-end residential space to one of the city’s most popular upscale lifestyle destination. 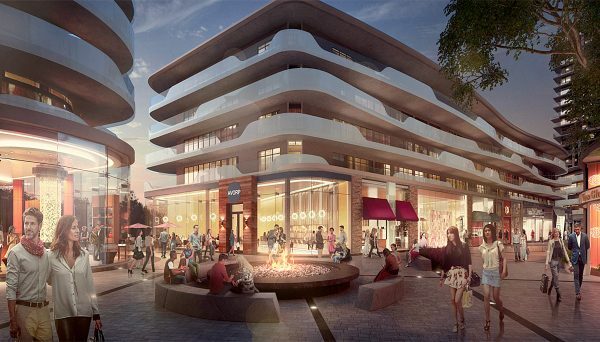 The Bayview Village neighbourhood is an affluent, connected and family-friendly pocket of North York, and starting to gain popularity among young urbanites, as more condominium projects begin to populate the area. The shopping centre is easily the anchor of the neighbourhood, providing access to high-end retail, restaurant and office space in a spacious and light-filled building that offers valet parking and personal shopping services. The neighbourhood is conveniently bound by three major arteries – Finch Avenue east, Leslie Street and Bayview Avenue – and highway 401. Whether you’re commuting into downtown Toronto or to elsewhere in the GTA, it’s a connected and convenient place to call home. The site of the condominium proposal also happens to be just steps from the Bayview subway station, providing seamless access to some of the city’s most popular destinations. Craving major greenspace? It’s just a few minutes’ drive or a quick subway trip to a network of lush parkland that surrounds the Don River to the east, a great place to get back to the basics and forget you’re so close to the city. It’s a neighbourhood that has seen some reinvestment during the last decade - including a 45-acre master-planned community just to the south – but this particular development will be one of the most transformative. Adding not just more residential space, but more employment opportunities and pedestrian traffic, this is a great spot to consider investing in if you are attracted to the North York region. 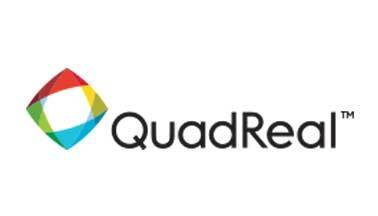 QuadReal Property Group is a Vancouver-based firm that comprises a team of seasoned real estate professionals focused on managing and growing the extensive portfolio of real estate assets owned by the British Columbia Investment Management Corporation. QuadReal prides themselves on a fresh, yet long-term approach to building, which can be seen across the globe. They’re responsible for the successful development of Commerce Court in downtown Toronto.